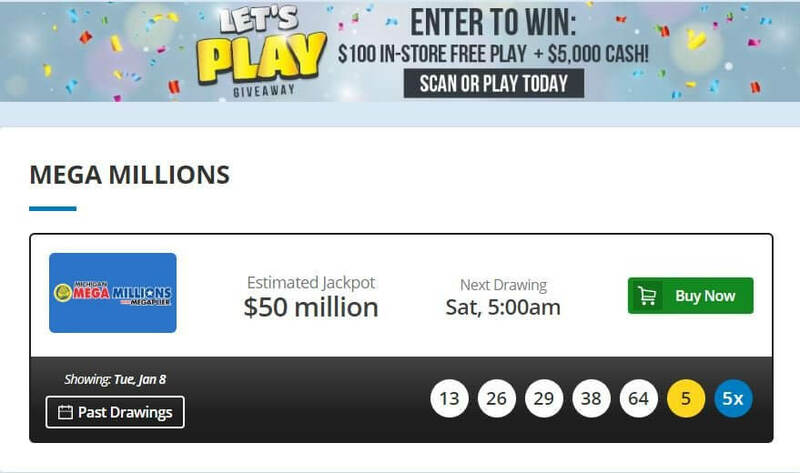 Michigan lottery website offers over 200 games, but the majority of people are attracted to their Powerball and Mega Millions draws. These lottery games have two weekly draws each, with a jackpot that exceeds $40 million. If you’re a resident of Michigan and would like to know all about these popular games, keep reading as we will talk about their rules, schedules, withdrawal of winnings, and more. What are Michigan Lottery Powerball & Mega Millions? How to play Michigan Lottery Powerball? How to play Mega Millions on Michigan Online Lottery? Powerball and Mega Millions are the two most popular draw lottery games in the United States. You can buy tickets online on the Michigan Lottery official website from 44 different states. While these two games are very similar, there are also some slight differences between them. Apart from their names, the two games differ only by a couple of numbers. Michigan Lottery Mega Millions has 70+25 balls, while the Michigan Lottery Powerball includes 69+26 balls. Both games have a jackpot starting at $40 million, although Powerball jackpots are usually bigger than the ones won on Mega Millions. Michigan Lottery Powerball is easy to play and understand. Whether you buy a ticket at the retailer or you decide to play online, the rules of Michigan Lottery Powerball are exactly the same. There are 95 numbers, 69 of them being regular white balls, and 26 that represent the red Powerball. You need to select five regular numbers and one Powerball number. You can play up to 30 consecutive draws. When are the draws taking place? The draws for Michigan Lottery Powerball are conducted on Wednesdays and Saturdays at 10:59 p.m. Each ticket costs $2, but you can also select the Power Play option for $1 more and have a chance that your winnings get multiplied 2, 3, 4, 5, or 10 times. The tickets must be purchased at least 15 minutes before the draw starts. What are the prizes and how to withdraw them? The minimum jackpot for Michigan Lottery Powerball is $40 million. Correctly guessing all the numbers will win you a jackpot. Guessing 5 white balls alone is worth $1 million in prize money. Four white balls plus the Powerball will earn you $50,000. Power Play is counted for all wins except the jackpots. If you win $600 or less, the funds can be directly sent to your lottery account. For prizes between $600 and $50,000, you will need to fill out a special online claim. The prizes which are worth more than $50,000 must be withdrawn at the Michigan Lottery headquarters. Michigan Lottery Mega Millions is the second most popular lottery game on this website. The rules for Michigan Lottery Mega Millions are similar to Powerball. You will need to select five numbers between 1 and 70, and one Mega Ball number between 1 and 25. Just like Powerball, Michigan Lottery Mega Millions offers you a chance to multiply your winnings via the Megaplier. The jackpot of this game starts at $40 million. The draws for Michigan Lottery Mega Millions are taking place every Tuesday and Friday at 11:00 p.m. You need to buy your tickets 15 minutes before the draw starts. The tickets cost $2 each and can be purchased online or in-store. The Megaplier option will cost you an additional dollar and it can be 2X, 3X, 4X, or 5X. The withdrawal process for Michigan Lottery Mega Millions is exactly the same as for Powerball. The wins below $600 are automatically transferred to your account, and the prizes exceeding that amount require a special form to be filled out. If you’re lucky enough to win $50,000 or more, you will need to go down to the Michigan Lottery headquarters in Lansing. Is there a bonus currently available? Michigan lottery does have a welcome bonus that, when used, will grant you 10 free games on Queen of Diamonds just for signing up. You can also enjoy daily spins on the website, which offer cash and other prizes. Can I play Michigan Lottery Mega Millions or Powerball on mobile? Yes, these games can be purchased and played on your mobile device. Michigan lottery also has a dedicated app that’s available for both iOS and Android devices. I have a problem with the game, what should I do? The best thing to do in this situation is to contact the customer support and tell them about your issue. The support team can be reached through the live chat, email, or by phone.